This past week was our almost-back-to-normal week. There were no special celebrations scheduled, no shopping trips to redecorate a room, no Mom & Amber lunches out, and nothing to make the week out of the ordinary. Still, it was not an ordinary week. Amber had all her regular lessons, including the newly added logic and writing subjects. School work was productive and progress was made in every subject. I am astonished at how well Amber picks up math concepts. This week we've been working on probability and chance, and she breezed through like she's being doing it all year. I don't remember math coming so easily as a child, and I grew up to have a minor in applied mathematics. I still despise statistics though. We've also made good progress in Religion lessons. After feeling bogged down with our study of the commandments and their meaning for most of the school year so far, it was refreshing to start on the first article of the Apostle's Creed. Amber wasn't too thrilled with the longer memory work, but she has memorized it before and will again in confirmation. It's not like she didn't spend years in Lutheran schools with regular memory work. Working on Apostle's Creed, finally. Amber had another good week in dance, even with the additional class. The Leaps and Turns class is small this semester so the girls are receiving very thorough lessons. Amber was thrilled this week to continue working on her fouetté turns. She has wanted to do them, properly, for years. These are the turns where the dancer goes up into releve with the supporting leg while the working leg extends into 4th position and whips around. Amber is up to 3 fouetté turns before things fall apart. Pretty good! Tuesday we had a bit of weather excitement when our possible flurries turned into the most snow we've had all season, around an inch. 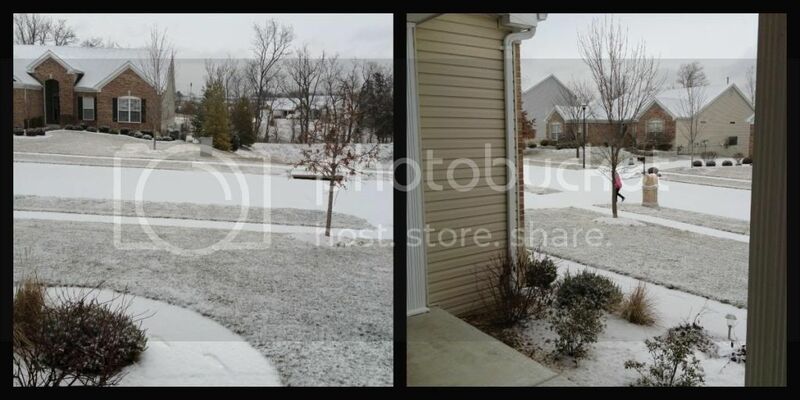 It's been a pretty pathetic Winter here, again. There still wasn't enough snow to play in, but at least we wore snow boots to the store. 1. Really rough fouette turn. 2. Ending a cycle of three fouette turns. 3. These are all the shoes she takes to dance. 4. New shoes! 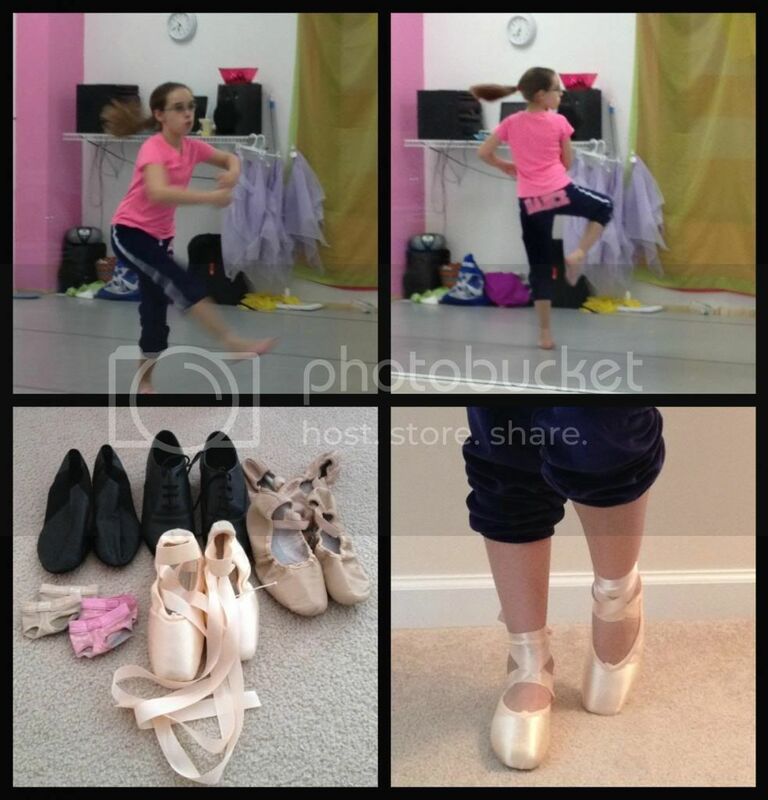 Her first pointe shoes! She's actually only in pre-pointe because she is growing like a weed still. Only one foot on pointe at a time, to keep weight on the opposite leg. Amber also had a Girl Scout event on Thursday for all the troops associated with our church. It was a pilot program being tested on Zion's troops with Marshall the Miracle Dog. Amber enjoyed the program and loved seeing this amazing dog, but came home somewhat subdued. She still isn't always comfortable around the kids from Zion. The out of the ordinary part of the week began when Amber had a few sensory rough patches and continued to major self esteem lows. This weekend marks the one year anniversary of when we withdrew Amber from parochial school. If you haven't read our reasons for homeschooling, to sum it up, Amber was being horribly bullied and the school did not have a reasonable response. We are still slowly learning more details, even some this week, of what happened at school. Amber repressed it all for so long, but with help from the psychologist and sensory therapy she is able to release those agonizing memories. It is heart wrenching to hear and resulted in an unprecedented two meltdowns this week. I pray we are now in a new calm phase and am amazed any school happened this week at all. I must say, while we started homeschooling for a specific reason, we have found it to be beneficial in numerous other ways than simply repairing damage from bullying. We have time to properly address the sensory processing problems, time to let Amber dance, and the ability to participate in many more music and arts programs than were available at school. Amber has been able to spend a year learning a foreign language and have an education tailored specifically to her. Towards the end of our first semester of homeschooling, Amber and I made a list of our favorite benefits of homeschool. To mark our one year anniversary in homeschooling, we are making new lists that I will post next week on our official anniversary. I had great intentions for this post today. I intended to write about the huge success we have had with adjustments to the curriculum and provide some recommendations for others who might be in the same situation I was a year ago - desperately trying to figure out how to homeschool. Unfortunately, it took all I had to trudge through Amber's unexpected behavior and revelations this week. So, that more useful post will be for another time. She used the TLP (The Listening Program) a lot this week. 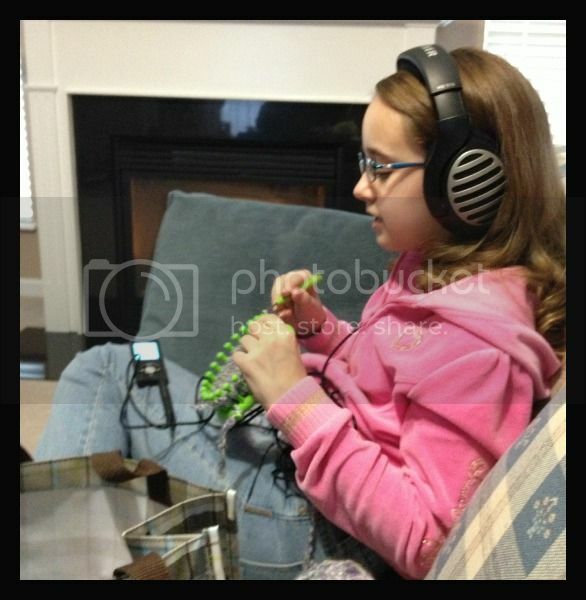 Even while knitting she needed the calming program, it was recommended by her sensory therapy. Today, the sun is shining and things seem to be clearing up all around. Amber made great progress this morning at her regular sensory therapy and now is awaiting the arrival of a friend for an afternoon of fun. We aren't going to do anything special today; the girls are just going to relax and have fun together. This is probably the best way to end an overall stressful week. Oh, Amber. :( But just think - getting some of that "stuff" out and dealing with challenges this week will mean better self-esteem and coping later. Hang in there! It is wonderful that you were able to homeschool her and give her time to heal! 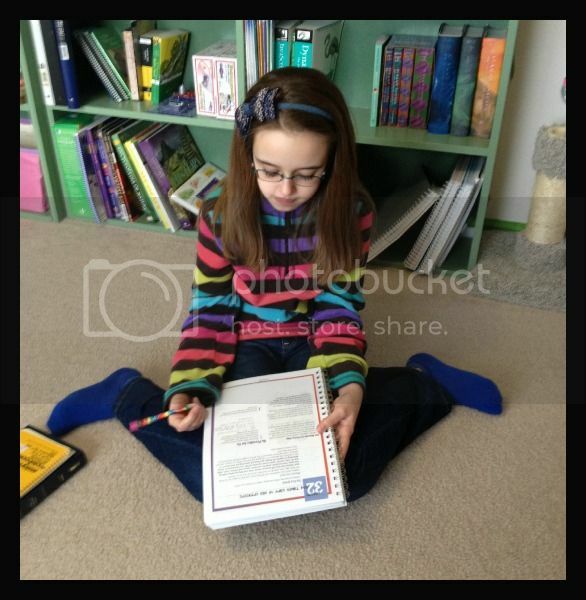 It is wonderful that we can homeschool and help her. It was a difficult week, but one that needed to happen for her to move forward. I just wish we had a little bit more warning before these weeks. I just want to echo what Our Side of the Mountain said. It's so good that you were able to pull her out of that environment. Christy -- I think you are an awesome mother! You care so much about Amber and have done whatever it takes to make her education just right for HER. If every child could have this kind of advocate, wouldn't it be wonderful? I hear in your post that you might be tired and frustrated, but I want you to know I admire you and all you do with your daughter. Keep up the good work. And, thanks for linking so I can get to know your family better! Thanks Mary. I am tired. That is a good word for it. My patience with everything is short these days. I'm praying for a renewal. Thank you for the positive words and encouragement. They go a long ways after a week like we had. No one knows their child better than a mother. You are doing a great job! Thanks for linking up to Its a Wrap, Christy. I hope you'll return this week.